Seven albums is an almighty achievement for bands these days, many not making it that far, especially in the non-mainstream genres such as pop-punk and alt-rock. So I'll start by applauding All Time Low for making it this far, after more than ten years together, and still with their original lineup. Recently their contemporaries, like Fall Out Boy and Paramore, have turned their sound towards the pop music of the mainstream, sounding very different to their earlier releases. 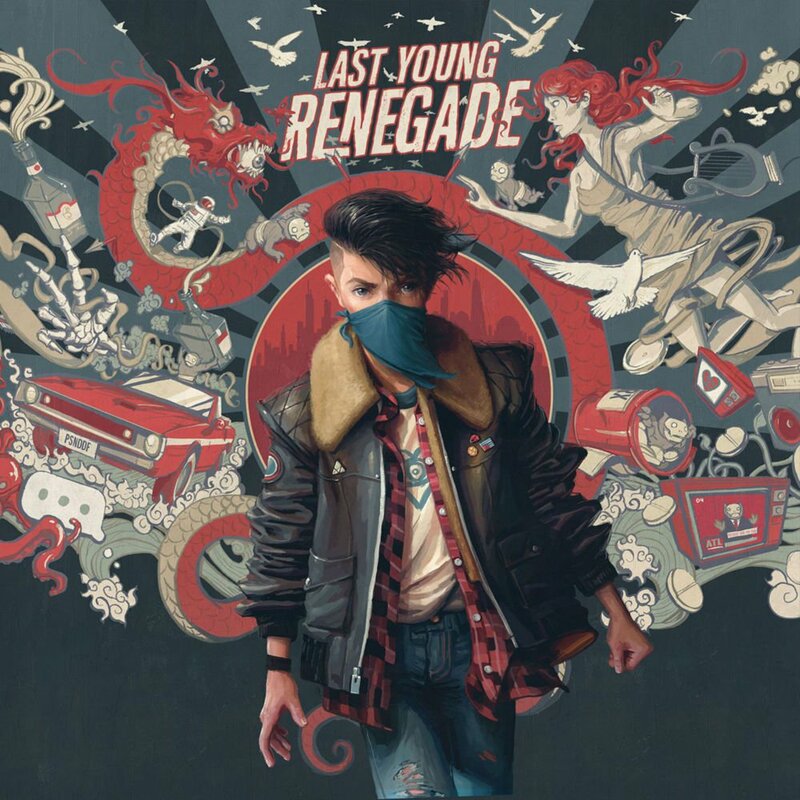 And after hearing the first few singles from Last Young Renegade, it shouldn't come as a surprise that All Time Low have turned down a similar direction. So how does this release stack up to the rest? Personally, I have mixed feelings about this one. I've given it several listens in the past few days, and there's tracks on it I love, and tracks I could take-or-leave. My overarching feeling about the whole record is that there's too much synth usage and pop-esque influence on it than I would typically like - I've entirely lost interest in Fall Out Boy and Paramore these days, but I've always liked ATL more than them anyway, so I really don't want the same to happen here. I started liking All Time Low for their energetic pop-punk, guitar-heavy music, and while I love bands who aren't afraid to experiment with their sound - at 7 albums in, we'd all be fed up if they all sounded the same - this time the experiment took them away from what I typically like. There's a lot of slow, sweeping sort of tracks, which I would enjoy if there was more of a rock or punk edge to them, but the plentiful use of synths on many of them puts me off a little. All Time Low have used synths in the past, and done these slower tracks with them before, but it felt like there was too many of them for me this time, and not enough of the catchy, upbeat, fun music I love from them. It doesn't feel as big, energetic or in-your-face, instead taking a slow, subdued ride through its ten tracks. The tracks I do enjoy the most are the ones that feel most like All Time Low's previous couple of records. This isn't to say that what they've created here is bad by any means, and I don't dislike it; it's just not to my personal taste, and not my favourite record of theirs, which is a little disappointing after I enjoyed 'Future Hearts' so much. The titular opening track, 'Last Young Renegade' is one I do like a lot, with so much of that youthful energy that All Time Low usually bring to their music, and which I enjoy so much. The lyrics speak of love and nostalgia and some recklessness, and there's still enough of a pop-punk influence on it, making it a promising start to the album. 'Nice2KnoU' is another that I really liked, the track that feels most like an ATL song, with plenty of guitar riffs featured, an fun, upbeat tone to it, and lyrics thanking the people that got them where they are today. 'Nightmares' veers into the synth spectrum a bit more, but I still really liked it, as I felt they were appropriately here for capturing this eerie, emotional lyrical content, and weren't overused. 'Dark Side of Your Room' is another favourite of mine, with some slightly more suggestive lyrics (though still serious), and plenty of guitars once again. The first single from the record, 'Dirty Laundry' was a mixed bag for me, as it felt very slow and flat at first, and I don't love the synths at the end of the chorus; but I love the last chorus, when the guitars kick in and the whole things swells and peaks. 'Ground Control', the Tegen & Sara collaboration, was one where I could get onboard with the pop influence, since it was a collaborative effort and takes elements of both band's musical styles. 'Good Times' and 'Life of the Party' were the lower points for me, as there's just too much synth on them for me, and they don't sound much like what I expect from All Time Low, nor like any of the music that I generally enjoy. And 'Drugs & Candy' and 'Afterglow' are both fine, and I liked them enough, but didn't stand out for me in any way - actually, not many of these tracks are as catchy as I would have expected from this band. I did also find this record lacking in lyrical content a little too. There's definitely a maturity to it, as the songs about partying and chasing girls and youthful escapades are largely gone, replaced with nostalgia and deeper emotions. Don't get me wrong, I love some emotional depth, and All Time Low have definitely shown us that in the past, with many songs in the past written as messages of support, love, and encouragement to their fans ('Missing You', 'Kids in the Dark'; but aside from the gratitude shown on 'Nice2KnoU', there aren't any tracks with that sort of content this time around. And what I really miss is the clever imagery (think 'If These Sheets Were the States', "Somewhere in Neverland') or the cheeky, suggestive lines ('Dear Maria', 'Damned if I Do Ya'). Yes, growth and maturity are good, and necessary for a band to evolve and continue on, but this feels so serious all the time, and I can't help but miss the humour and goofiness of this band, the elements of them that I enjoyed the most. To conclude though, I want to stress again that I don't dislike the album, and I don't think it's bad. I applaud experimentation and evolving one's sound over the years, and I understand that band's will mature and change with time, as they should. Its just that, in this case, the result is simply not something I enjoy as much as any of their previous records. I miss the humour, the guitar-focussed tracks, the upbeat and energetic songs, the big, anthemic choruses; I don't care for this slow, serious, synth-heavy direction they've taken this time round. I expect this will draw some new fans to them, but potentially drive some old ones away. They don't do this style badly; they've just chosen a route that I don't want to follow them down this time. This post contains Amazon Affiliate links, and I will receive commission on any purchases.